A sales funnel is a visualisation of how many leads you need to convert into business. It helps you to look for areas of improvement in your sales process, forecast future production / resource requirements and ensure Sales are focusing their efforts on the right type of leads. The first step in creating a sales funnel is to set a quantifiable goal, this will be based on the number of sales you need to achieve in a given period. Then work backwards through each step of your sales process and work out your conversion rate at each stage. Working backwards from your sales goal, and factoring in your conversion rates enables you to estimate how many leads are required to generate the sales you need. Regardless of what business or industry you are in, the last thing your prospects want in today’s marketplace is to be sold to. Now, buyers want to be advised, counselled and coached through their buyer journey. Modern Sales is tough. To excel you need to be able to juggle multiple activities at once. No longer can you just pick a page of the yellow pages (for example), and bang out one cold call after the other, pushing your message onto unsuspecting businesses in the hope that you hit gold. Nurture relationships on social or through email sequences - always be helping until the buyer is ready to talk. Conduct research online to understand the prospect's business before any interaction or conversation. Meticulously research each call in advance to ensure they understand the prospects pain. The solutions selling approach of the 1980s/1990’s is no longer fit for purpose for many businesses, and a new approach is needed, which is where inbound sales come in. But what exactly is inbound sales and why does it fit so well with how today’s buyers make purchases? Advisory - Inbound Sales' is focused on building trust from your buyers. Personalised – hand in hand with generating trust is an ability to connect with your buyer. Buyer-Centric - make the sales process focused on the buyer rather than the seller. 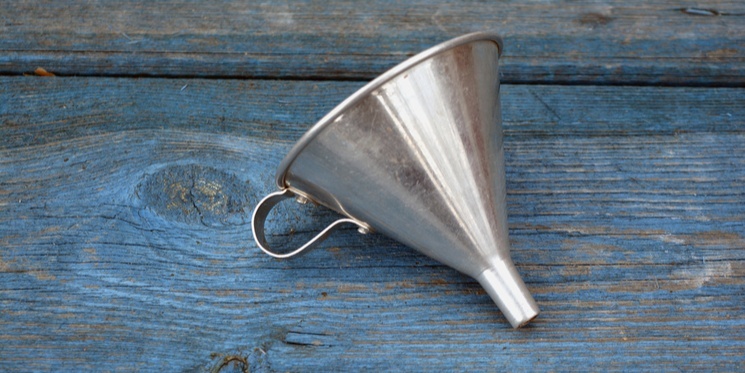 While the finer details of an inbound sales funnel can (and should) be different for every organisation, a basic three stage framework lays the foundation. At this stage in the funnel, you probably have a significant amount of ‘leads’. But, frankly, a majority of them are not going to buy from you. They know they have a potential problem, but they’re not quite sure how to solve it, so they’re doing their research. A blog is an excellent way to attract new visitors to your website. To get found by the right prospective customers, you must create educational content that speaks to them and answers their questions. Your social media strategy needs to then share that valuable information, engage with your prospects, and put a human face on your brand. Inbound marketing can help you attract high volumes of leads. The challenge then becomes, how do you separate the quality leads from the people who are just starting on their buying journey? That’s where lead management and lead scoring comes in. With lead scoring, you can attach values to each of your leads based on their professional information and the behaviour they’ve exhibited on your website. By determining the criteria that make up a marketing qualified lead, and a sales qualified lead, will help you to narrow your Sales focus and push more of the right people into your sales funnel. The potential buyers are still not ready to be ‘sold to’. Buyers at this stage have a clearly defined problem they need to resolve. Your lead scoring should have now defined these prospects as marketing qualified leads. People at this stage are looking for insight and knowledge around their area of interest. They want help from someone who can understand the context of that interest. Useful content at this stage may be guides, videos, podcasts and webinars. Sales need to focus on building trust before reaching out to speak with a prospect. And they need to take every opportunity to personalise the experience. Remember not all buyers are the same, and expecting every lead to react the same way throughout your sales process is antiquated and unrealistic. Leads in BOFU are sales-qualified and ready to purchase. They have done a significant amount of research, have defined their solution, and have probably identified a short list of companies that they’re comparing. They know who you are, what you do, and what you provide, and it’s likely they have the same information about your competitors. When Sales connect with these people they need to be in exploratory mode and ask relevant and informed questions, then listen and adapt to 'follow' the conversation and build more trust. A good inbound salesperson is tuned into discovering the prospects real intent and ascertaining if their solution is a good fit. The inbound sales pro mantra is “always be helping” (not closing). Sales cannot roll out the same presentation deck to every prospect. Instead, they must offer advice based on the challenges, circumstance and needs of each contact. And they are using content, language and propositions they will understand. Using your conversion rate data you can look at any areas of the sales funnel that are underperforming. By having a visualised sales funnel you can revisit your sales process and fine-tune any areas of weakness to make your sales funnel as efficient as possible. You can also identify areas where sales and marketing need to be more aligned and supportive of each other.